The Leela of Jagdeo Warnersingh....Hari Om! My dear devotees, today I have a very special story to tell you from the Hidden 5 Books of the Gita....yes. It is a tale of a warrior so mighty and so strong, that even religion bows to him! It is the tale of Jagdeo Warnersingh. The tale starts many years ago. He was born under a funny moon, so funny that it gave Warnersingh, who was clearly of the highest possible caste the darkest of skins and the curliest of hairs, even more curly than journalists, but, unlike the Biswas of Mohun, he did not have an unlucky sneeze....no instead the gods granted him the boon of a stutter. This stutter was so powerful that it fooled its listeners into thinking Jagdeo a fool, a buffoon, and so, his cleverness and cunning was sealed from the world for a long time. Perhaps it first came to light in the form of plagiarism in an unfinished postgraduate degree. Perhaps it came to light when he, at first a lowly teacher rose to great heights in the great court of the Fifa. Either way, Jagdeo Warnersingh moved from lowly teacher to Fifa Executive and in the year 1990 achieved his first great act of cunning! He fooled over 1 million people into believing that he was in support of national football. In the course of that feat, the gurus say Warnersingh rigged a football game and oversold a stadium and escaped with not so much as a rap on his clever little knuckles. Ahhh my dear devotees, but in the years to come his tricks would get even more complicated. He would gain ever greater heights in the pantheon of Fifa, becoming a Vice President and being the right hand man of Titans such as Joao Havelange and Sepp Blatter. Yes, my dear devotees, so great is our dear Jagdeo Warnersingh that he straddles several mythologies and transcends even the hidden books of the Gita! Warnersingh built further on these accomplishments by purchasing a political party with his earnings from Fifa, and it is here my dear devotees that the true Leela of Warnersingh really begins. You see, there were others in this Political Party who feared and hated the Warnersingh, because behind his stutter, deep in the recesses of his jaw he his files....yes FILES my dear devotees. The Warnersingh had information, cleverly hidden from his closest enemies about all of their questionable activities and in this Political Party that he purchased he thrived. His enemies believed that Warnersingh's curly hair and dark skin would be his downfall....but my dear devotees they did not consider that the colour of his money would transcend the colour of his skin and so their evil wishes for Warnersingh were magically removed by the colour of the Benjamins! Another Titan from a different mythology! Ah, my dear devotees, see how our beloved Jagdeo is blessed. Eventually Jagdeo began eyeing the highest seat in the land, but he was blocked from it by two demi-gods, both of high caste, the Panday and the Manning. Warnersingh then vowed to remove these two demi-gods from his path and looked for an instrument. The instrument he found was as beautiful as he was not, and if he were Ram, she would be his Sita. Yes my dear devotees, Jagdeo Warnersingh found his Rani in Kamla and together they decided that they would crown each other. Kamla was eager for his financial support, and Jagdeo was eager for her voter base. Together they made history, and then Jagdeo hit a dark period. 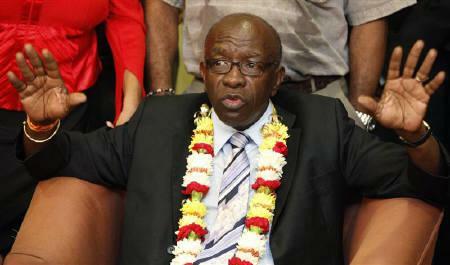 The Titans of Fifa turned against him, our hero was left in the valley of the shadow of Suruj, and it seemed that he was on his last leg when an internal elections returned him to his strength and gradually the Rani, who seemed to have turned her back on him, remembered the powerful files in the back of his throat and put Jagdeo to serve her on a secret council of Security. Then, when she felt no one in the Kingdom would care, she elevated Jagdeo to be her right hand and keep the land secure! So great the Warnersingh had once again become that he smashed all murtis and sacred spaces in his path to success and Brahmin by Boat pundits with the surname Maharaj rushed to place malas around his neck and proclaim him the true warrior of Dharma! But wait! Lo! Behold, Lawrence of Maharaj and The Keith are waiting in the wings my dear devotees....This Leela isn't done!